We’re off in pastures sunny again, so both the wifi and I are a little unreliable at present. But I am sitting under a parasol, on a sunny terrace, overlooking the sea. I have sent the loved one and our friend off for a walk -but really so I can sit and draw without feeling rude and/or guilty. Not a lot to show you, as we have been very sociable this week. The alcohol quotient has risen significantly – the buggers keep coming round and offering it and it would be rude not to. Someone, possibly the loved one, suggested it wouldn’t happen if we didn’t go in the bars in the first place but I don’t feel inclined to put it to the test. I like the Diva Challenge this week and I see a lot of other people do too. I haven’t looked at any yet, saving it as a treat. So we’re celebrating Amanda Day -see the Diva blog for more detail- and I started by drawing a freehand circle for my Earth. A bit wobbly but I blame the pen, as no alcohol has passed my lips so far today. No, really. Said pen is not my usual Micron, but a gel pen and it doesn’t respond to the surface of the paper, but glides too easily over it, which I don’t like much. But it is what it is . Lesson learned, Maggibee will stick to her usual pens in future. I used patterns beginning with A for Amanda ; Abeko, African Artist and A-Dalfa. I like all three and must try to remember them when next I am seeking inspiration. So, for now, here is my less than perfect response to the Challenge, folowed by a fond farewll. Until next time, world, be good-ish. This week’s challenge is to use coffee, tea, wine, watery paint, or some other liquid: Spilled, dripped, sprayed, blotted, or ringed on your tile to create a string. So that’s just what I did, almost. The tea barely showed up on the tile when dry, so I dribbled some Brusho ink (Sandstone colour) onto the damp paper, stood the jar on it for a while and then went off to have lunch. This is what the tile looked like when dry. I thought it looked like Revenge of the Were Rabbit at this stage, certainly not a cute Easter bunny anyway. So I outlined it with Pigma Micron 03 to see if that helped. It didn’t, much. So I did a background in Tearce, which I recently rediscovered and am enjoying using. I then had a pause to decide on a filler pattern, decided to stick with the letter T and went onto Tanglepatterns.com for inspiration. I’d never noticed this one before – Ta Da – and, although I’m not entirely happy with how it turned out here, I can see all sorts of possibilities. The shading is less than perfect because I used a Promarker pen on water colour paper and it soaks in too much. Lesson learned. And that’s it for now. More tales from beyond the horizon soon but, until then, be good- ish. Home from a recent trip, I spent two evenings stuffing soft toys I’d started while we were away. I have a very low boredom threshold so I always take things away with me to keep me occupied. Drawing things – obviously- crochet, my Kindle and a tablet to keep in touch with the world and play idiotic games on. The rest of my attention is taken up by eating, drinking and going for walks with the loved one. This trip the walks were slightly marred by my recent acquisition of an arthritic knee, which slowed me down considerably, in spite of anti inlammatories, pain killers, a knee brace and a telescopic walking stick bought for me by the loved one. You may perhaps imagine the expression on my face when he gave it to me. Grateful appreciation was not top of the list. Admitting that I might need one is not the same as being handed one as a pre holiday gift. However, it may not have been appreciated but, to my easily imagined chagrin, was useful on occasion. Back to the stuffing. I have been making amigurumi toys; you may remember the armless doll, still incomplete, but I WILL finish her, probably this week. Well I took some yarn away with me and started a mermaid doll. Because I hadn’t taken stuffing – oh come on, even I don’t take soft toy stuffing on my hols – I had to stop at the point where I was decreasing for the shoulders, otherwise it would have been too narrow to get the stuffing in at a later time. Just look at the subtlety of the shading here. And the vibrant colours on this one, wow! Well it took me a while to work out what to do. I looked at the Mooka one first and decided on some sort of motif pattern top left, somehow linked to what Michele had done. I did a fair amount of rough practice on scrap paper and eventually took a deep breath and drew Cirquital in the top corner, using some of the colours in the Mooka. Unfortunately, mine were deeper than the ones Michele had used, so I used a little of my red over hers to tone them together. This was, I thought, the finished version but it didn’t work – almost, but not quite. There was no link between the two parts, even though I had used the Tipple and Pokeleaf as a unifying element, they were just two patterns that happened to share a page. Nervously, because at this stage I didn’t want to ruin the whole damn thing, I added a few ribbons to join the two areas. And, in my humble opinion, it worked. Phew! I hope she doesn’t think I spoiled her starters. So, feeling positive, I started on the brightly coloured one. The bottom left corner just did it all by itself; I didn’t have to think about it at all. But the top right had me puzzled. In the end I went off on Pinterest looking for patterns and found this one – called Muscari by Elaine Belfatto. Once it was in, I could see it was a disaster – not the pattern but my execution of it. My shading, colouring and drops of white were a frantic attempt to disguise my failure and, in the end, it looks OK. But it doesn’t live up to expectations. Bugger! So I decided to send a couple back for Michele to complete. I went for plain and simple design on splodgy (That’s the technical term) inked backgrounds. I shall put them in the mail tomorrow and see what happens. And then it was Diva Day again and I read the Challenge with high hopes. This week’s challenge is a string challenge where you are to use a Circle and a Square in some form for your string. You can take this in any direction you like, you can use MANY circles and one square, you can use many squares and only a few circles – just make sure you use at least one of each. You can also free hand your circle or square if you want, or if you don’t have access to things to trace. It’s all good. So, since I am completing a swap using triangle tiles, I used one and drew a square-ish square and surrounded it with circles. I can’t remember the name of the pattern, it’s the new one from the mother ship demonstrated by the two little girls on the newsletter and I like it soooo much more than I first expected to. I also can’t remember the name of the Greek key pattern inside the square but it’s an old favourite, just shaded a little. And here are the rest of the swap. The jury’s till out on whether or not I like the 3Z tiles but I did enjoy these. And I think that’s all for now. My daughter and family are joining us for a few days, so it will be bedlam at the home for the terminally disturbed this week and we will heave a sigh when they leave but, oh, it will be fun. 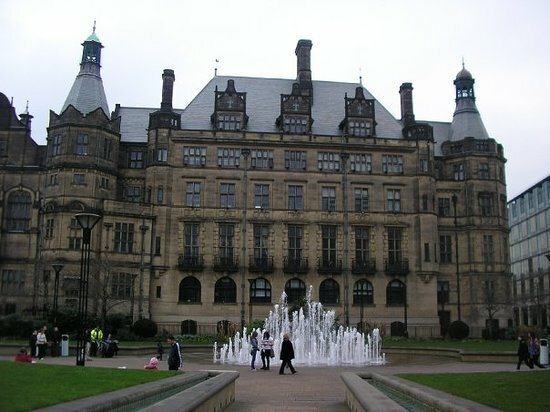 We went to Sheffield. Now, in comparison with the Marianas Trench or K2, I suppose Sheffield doesn’t impress you much but, for the loved one and me, it was an adventure. We’re used to travelling around Europe but we don’t do cities much. I like the seaside and promenades and beaches and I like magnificent mountains and barren terrain but somehow we never do cities. It’s alright in theory but when it comes down to going out, we tend to pick coastal or rural rather than urban.